What the Heck Is Imperfectionism, Anyway? LCN 068: What the Heck Is Imperfectionism, Anyway? If you’ve been following me for any time at all, you know that I’m a self-declared imperfectionist, and imperfectionism is a foundational concept when it comes to living a full-color, creative life. 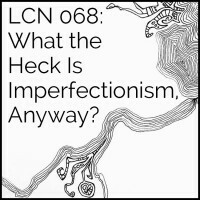 It’s easy to think that imperfectionism means sloppiness. Settling for less than what we’re capable of. But imperfectionism isn’t that at all, and I want to set the record straight about what imperfectionism is. The other day I wrote a blog post about it, specifically aimed at my calligrapher readers, because ever since I started doing calligraphy again, after pretty much avoiding it for years, I’ve been struck by how much it brings out my perfectionist gremlins. Practicing intentional imperfectionism for the past few years is the reason I’m able to approach calligraphy again without becoming utterly frozen. So I figured other calligraphers could probably use a lesson in imperfectionism. But of course perfectionism, and perfectionist paralysis, don’t just hit calligraphers. They hit all of us. So today I thought I’d share what I wrote in that blog post on the podcast. Don’t beat yourself up, love yourself up. When I can forgive myself for being human, and accept myself as I am, what other people think of me doesn’t have the same kind of grip. Creative Sandbox Manifesto, rule #2: Think process, not product. Creative Sandbox Manifesto, rule #1: There is no wrong. SSOOOOOOOO GOOOOD I’m super excited! This is the best podcast ever! Totally resonates!